Spray Insulation Ltd. specialise in the Polyurethane business, solving your problems and saving you money. From bulk foam applied by machines to Foamseal quick efficient machine free foam. With clients in the Marine, Transport, Construction, Leisure, and Petrochemical industries. Spray on expanding foam is the ideal way to insulate your loft conversion without the need for costly insulation contractors. What's more, Xpandi-Foam is an excellent foam sealant and is the only true seamless insulation on the market. Traditional insulation board and batts all require accurate cutting and edge sealing to prevent unwanted draughts. Xpandi-foam expands to seal gaps and uneven surfaces and insulates at the same time! This is particularly important under the new building regulations (April 2006) that require air-leakage testing of buildings to reduce energy requirements. 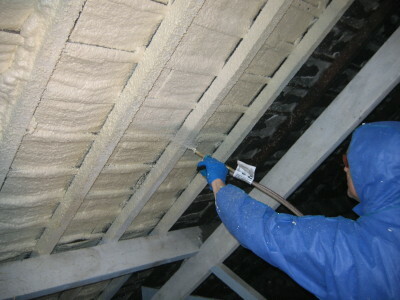 Visit our loft insulation page for more information. Spray Foam, Spray Insulation, Expanding Foam and Foam sealant are common terms for insulation, which is sprayed into place unlike traditional sheets or rolls of insulation, which must be cut and fixed into place. 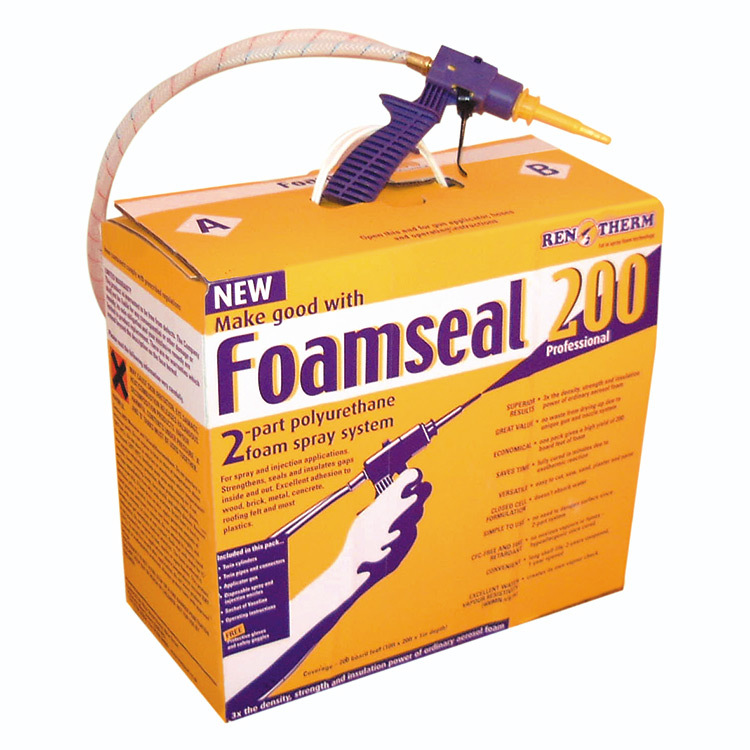 It is produced from two liquid components that, when combined and sprayed, produce an expanding foam froth. This expanding foam froth then hardens within 3-5 minutes to form a rigid foam with excellent insulating properties. Sprayed foam insulation is now available in do-it-yourself (DIY) kits. 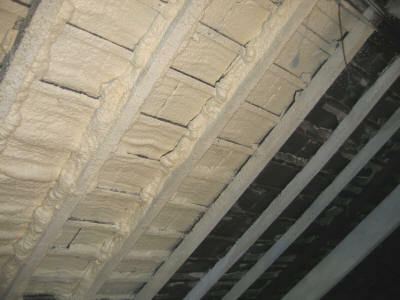 Visit our Spray Foam Video Page for video clips of spray foam insulation in action! DIY roof, loft and attic insulation. Insulating foam sprayed onto the underside of roof tiles not only insulates, but fixes the tiles in place and prevents slippage - perfect for roofs which are past their prime. Spray on Foam Insulation for Barn conversions and renovation. The foam can be sprayed between beams and joists, which greatly reduces the time to do the job when compared to traditional insulating methods. Warehouse Insulation. Reduce your warehouse energy bills and reduce condensation by sealing and insulating it with expanding foam. Insulating Narrowboats, canal boats & Barges - preventing condensation and improving your comfort. Insulation of Dormer window and Bay window roofs - preventing heat loss and condensation in architectural features. Cellar or basement insulation - The cured foam can be plastered or sanded and painted. Spa bath and Jacuzzi Insulation to reduce heat loss and save energy. Summerhouse Insulation - beat the heat in summer. What are the Advantages of Spray Foam? The sprayed foam sticks to most surfaces including metal, wood, bricks, concrete and tiles, making it easy and quick to apply. 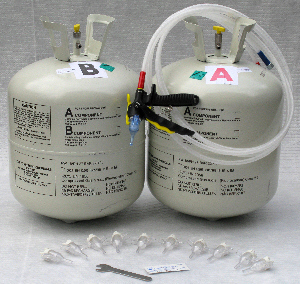 The kits produce an expanding polyurethane foam which expands at a ratio of 8:1 which makes it perfect for void filling and sealing out cold drafts. The Quick Cure nature of the Spray Foam means it can be sprayed onto walls and roofs (just like paint) and it won't drip or sag. The Slow Rise version of foam can be injected into a cavity or moulds where the expanding foam and fills the void before curing. 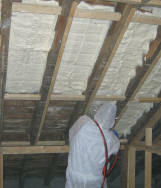 Heard some strange tales about sprayed foam insulation? Visit our spray foam facts and fiction page to read about some of the myths that exist.